"I DON'T normally like using the word inspiration, but with Darron, you can't really help it." Sunshine Coast Tri Club president Matt Dillon is talking about Darron Shields, whom he has come to know as a fierce and determined competitor, pushing even the most able-bodied athletes to their limits. Darron was a passionate triathlete in England when he had an unfortunate training accident in 2002 which left him paralysed from the chest down and confined to a wheelchair. He had finished work early for the day and decided to go for an afternoon training session on his bike. Unfortunately, riding at 40kmh, he collided with a car parked in the bicycle lane which he did not see, leaving him laying on the side of the road unconscious. When he regained consciousness, he realised that he could not move, having broken his back and severing his spinal cord. Darron spent two weeks in intensive care, and the next eight months in rehabilitation. "I kept a positive attitude, because life goes on and there are still plenty of opportunities out there," he said. He moved to Australia in 2004 to study sports science at the University of the Sunshine Coast. After watching new Aussie friends compete in triathlons, he slowly regained his competitive drive and passion for the sport. He decided to start training again, and became involved with the Paraplegic Benefit Fund (PBF) where he now works full time as the injury prevention program manager in the eastern region. Along with his 40-hour weeks, he still manages to find time to train a minimum of seven sessions a week throughout the three disciplines of his sport. Darron also recently became a Sunshine Coast Tri Club (SCTC) committee member, where he plays an integral part in raising awareness about paratriathlon. Since taking over the club presidency last December, Matt has developed programs promoting Athletes With a Disability (AWDs) as well as juniors at the club. He has big plans for the future, where he wants to see a large membership base made up of elite athletes, seniors, juniors and AWDs. "Darron is a positive member for the club," Matt said. "He encourages anyone and everyone to get down here and have a go, and shows them the right avenue to do so. "He's got a fantastic attitude and really helps highlight the culture of the club." Darron is passionate about building opportunities for athletes with disability. "It's not about the disability. It's about the inclusion and getting out there and giving it a go," Darron said. 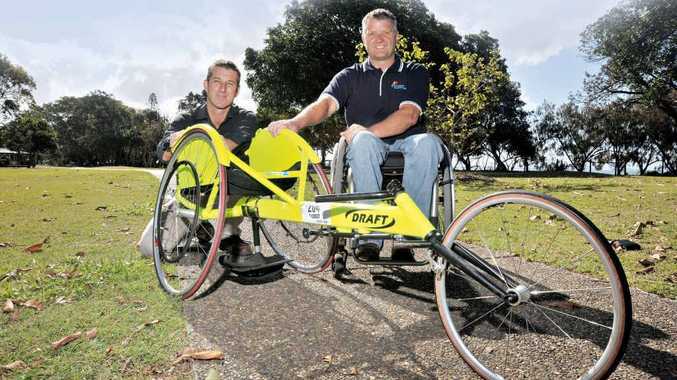 "At the moment, there are approximately five paratriathletes on the Sunshine Coast and we really want to increase that number. "Our main aim is to help gain funding and support for equipment and venue hire and at the moment Kawana pool is fairly supportive." Paratriathletes are self-funded and a hand cycle costs between $3000-15,000 and a race (running) chair about $4000. Darron recently received a cheque for $4000 from a local business owner who wished to remain anonymous. The money will be used by the SCTC to buy vital equipment for AWDs to compete in triathlons. Darron regularly competes in triathlons all over Queensland and recently qualified for the World Championships in his category to be held in New Zealand this month. Matt has seen Darron in action and describes him as a fierce and determined competitor who pushes himself every moment of the race. "Darron is a true inspiration to both able-bodied athletes as well as AWDs," Matt said.